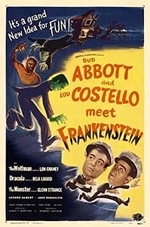 Abbott and Costello Meet Frankenstein is a 1948 American horror comedy film directed by Charles Barton and starring the comedy team of Abbott and Costello. The picture is the first of several films where the comedy duo meets classic characters from Universal's horror film stable. In this film, they encounter Count Dracula (Bela Lugosi), Frankenstein's monster (Glenn Strange), and the Wolf Man (Lon Chaney, Jr.), while subsequent films pair the duo with the Mummy, Dr. Jekyll and Mr. Hyde, and the Invisible Man. On a TV special in the early 1950s, the two did a sketch where they interacted with the latest original Universal Studios monster being promoted at the time, the Creature from the Black Lagoon (1954). The film is considered the swan song for the "Big Three" Universal horror monsters � Count Dracula, the Wolf Man and Frankenstein's monster, none of whom had appeared in a Universal film since 1945's House of Dracula. In 2001, the United States Library of Congress deemed this film "culturally, historically, or aesthetically significant" and selected it for preservation in the National Film Registry, and in September 2007, Readers Digest selected the movie as one of the top 100 funniest films of all time.